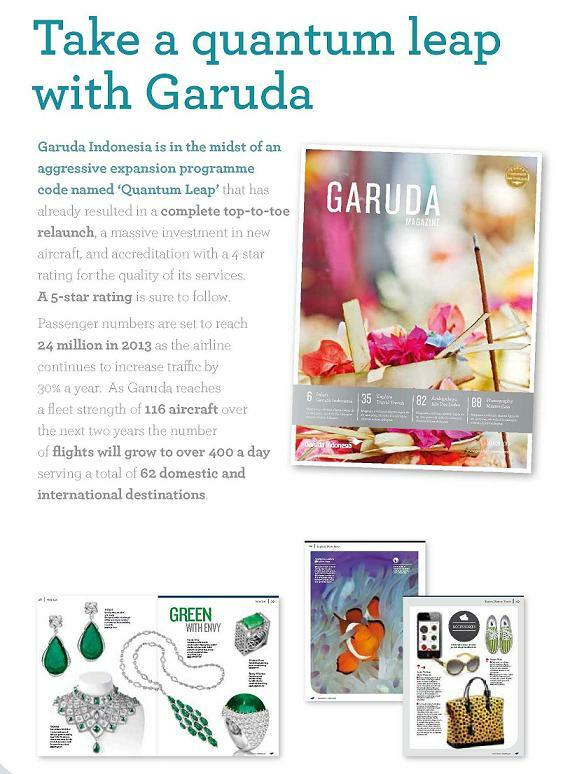 Garuda Indonesia has successfully achieved the aspirations of its aggressive expansion programme codenamed “Quantum Leap”, resulting in a complete top-to-bottom relaunch, with a massive investment in aircraft and continuously refined services. These efforts have culminated in Garuda Indonesia attaining the prestigious status of 5-Star Airline, making it Indonesia’s first and only 5-Star Airline, one of only seven in the world. Passenger numbers are set to reach 30 million in 2015 as the airline continues to increase traffic by 30% a year. As Garuda Indonesia reaches a fleet strength of 132 aircraft over the next two years the number of flights will grow to over 420 a day serving a total of 62 domestic and international destinations. * Credible alternative to other local magazine and newspapers. Colours was created as the result of a complete redesign of the in-flight magazine in 2013 to match the airline’s drive to achieve a 5 star rating. Now that Garuda Indonesia has achieved a 5 star status, Colours has never been more relevant, offering each and every passenger a truly first-class reading experience to suit. Passengers can enjoy editorial and photographic content that grabs their attention from page one with rewarding articles of real value to a domestic and international readership. It is available in the seat pocket on all flights and in the executive lounges. It is also sent to members of the frequent flyer programme and it is now available digitally on (Rizky to list digital platforms). A separate version of the magazine is produced specifically to appeal passengers travelling to the Middle East. As the national flag carrier Garuda Indonesia is charged with serving and expanding the domestic route network across the whole of Indonesian archipelago, flying to over 45 local destinations. 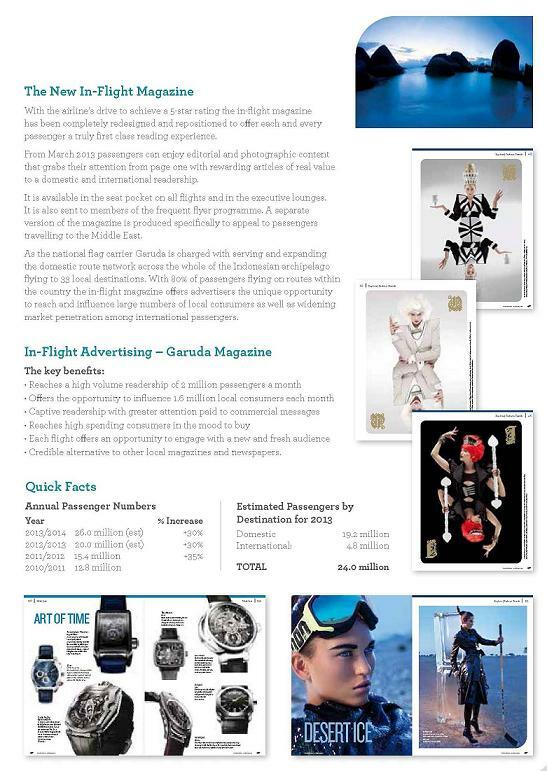 With 80% of passengers flying on routes within the country, the in-flight magazine offers advertisers the unique opportunity to reach and influence large numbers of local consumers as well as quickly widening market penetration among international passengers.